Advocates for Texans with disabilities are seeking serious reform in the 2015 legislative session — and they're hopeful that the turnover in statewide offices in November might help them get what they've long sought. As an entirely new roster of politicians takes statewide office next year, disability rights advocates are asking those future Texas leaders to work with lawmakers to address a struggling system of care for the state's most vulnerable population. But while their traditional allies in elective office — Democrats — appear up and down the ballot, those candidates are running well behind their Republican counterparts. And at a statewide candidates forum in Austin on Wednesday hosted by the disability rights groups Coalition of Texans with Disabilities, ADAPT of Texas and The Arc of Texas, not a single Republican candidate made an in-person appearance. Attorney General Greg Abbott, the Republican front-runner for governor who uses a wheelchair after being paralyzed three decades ago by a falling tree, submitted a questionnaire in his stead, citing a prior engagement. Disability rights advocates say they seek changes to the system of state-supported institutions for people with disabilities, a solution to the shortage of caregivers and relief from the massive waiting lists facing people who seek community-based care. Last month, the Sunset Advisory Commission, which evaluates the efficiency of state agencies, called on lawmakers to shutter an Austin-area institution for people with disabilities and to identify others around the state that might be closed later. And the Texas Public Policy Foundation, a conservative think tank, has jumped aboard the plan to consolidate or close the institutions — which have fallen under federal scrutiny for abuse and neglect allegations — as a cost-saving mechanism. 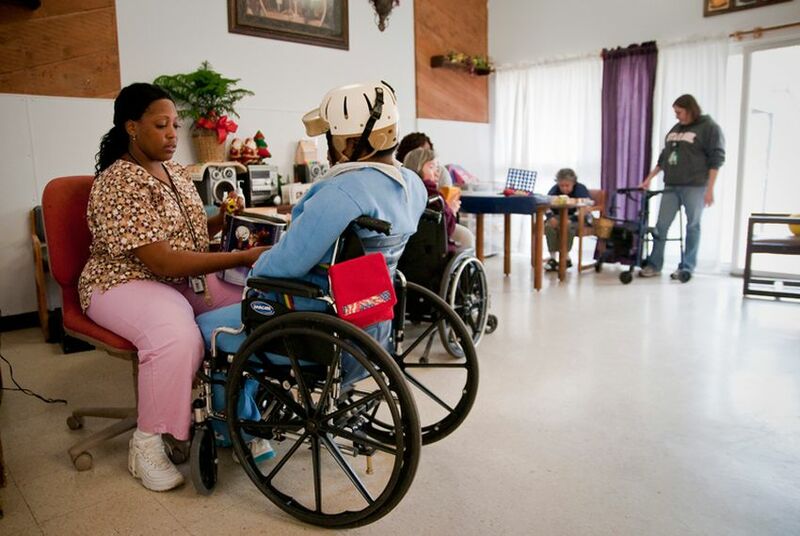 Texas spends more than $600 million a year to operate its state-supported living centers, which are home to 3,600 people — far fewer than their capacity. Meanwhile, more than 100,000 people are waiting to get into community-based programs. The situation has prompted public outcry from disability advocates and presents a tough challenge for lawmakers going into the 2015 legislative session. Wednesday’s forum was billed as a nonpartisan event for candidates for governor, lieutenant governor and attorney general, but only Democratic candidates showed. Gubernatorial hopeful Wendy Davis told attendees that people with disabilities were included in her campaign promises to invest in health care and public education. “As a state, we have to decide that this is a priority, that every single person in our state deserves to be successful and to optimize their opportunity to be a vibrant part of their community,” Davis said. Davis, a state senator from Fort Worth, has called for raising the minimum wage, a change she said would help curb the shortage of attendants for people with disabilities and reduce the long waiting lists that people with disabilities face when seeking community-based care. "If people are asked to do something that is challenging and they are underpaid to do it, we can’t expect that there are going to be people who want to do these roles,” Davis said. She took the opportunity to criticize Abbott, her Republican opponent, for his opposition to the Affordable Care Act and his actions as attorney general to defend cuts the state Legislature made to public school districts in 2011. While Abbott did not attend, he was the lone Republican candidate to fill out a policy questionnaire provided by the disability rights groups. His campaign said he could not attend the forum because he had already agreed to be in Midland and Odessa. “Most importantly, as a Texan with a disability, I will be a strong advocate for Texans with disabilities by demonstrating that individuals with disabilities have a rightful place in the mainstream of Texas culture,” he wrote. Abbott has frequently mentioned his disability and talked about overcoming adversity during his campaign. It is the subject of a recent campaign advertisement that has been praised by some political analysts. Democratic candidates Leticia Van de Putte, who is running for lieutenant governor, and Sam Houston, a candidate for attorney general, hold many of the same positions as Davis and took shots at their absent opponents for not filling out the policy questionnaire. Van de Putte said she had developed a more nuanced appreciation of disability rights issues when, after reconstructive surgery to her foot, she briefly had to use a wheelchair. Bobby Blanchard contributed to this story. Editor's note: An earlier version of this story said the Sunset Advisory Commission recommended that the state identify five state-supported living centers for closure. The commission has since recommended the state identify an unspecified number for closure.